The Queensland dates of “The Great Circle 2017” deserve their own dedicated postcard; it feels like the band has packed a month into the last 10 days ‘up north’. Their time in Cairns began with an early morning trip to the Great Barrier Reef aboard the boats Aroona and Flying Fish. After dropping anchor near the staggeringly beautiful Vlasoff Sand Cay, the Oils and some local marine scientists filmed interviews before the band had some epic photos taken on the Cay with a “Coral Not Coal” banner. Those pictures ran around the world over following days as part of the global #StopAdani coverage. A few hours later everyone regrouped on land for an intimate benefit gig in support of GBRLegacy.org at The Tanks Arts Centre. The band’s intent was apparent from surprise show openers “Surfin’ With A Spoon” and “Koala Sprint”. 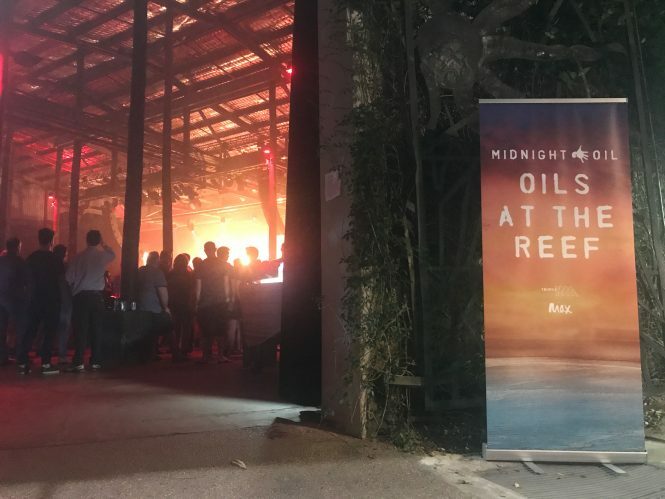 Their bespoke, ocean-oriented set from that night will feature alongside the interview footage they recorded on the boats in a TV and radio special called “Oils At The Reef” that will air shortly. On Saturday night Midnight Oil returned to one of their favourite venues in the world – the picturesque Kuranda Amphitheatre in the tropical rainforests of the Atherton Tableland – before heading to Townsville on Tuesday for another sold out show. Locals were treated to some seering onstage polemics about the Adani Coal Mine which is seeking a billion dollars of public funding before it can start digging up an area the size of Paris not far from this regional centre. Locals were also treated to the tour debut of “If Ned Kelly Was King” from Place Without A Postcard. According to the trainspotters, it was only the 7th time the Oils have ever played that song live and it was just its third airing since 1983. Two nights later at Rockhampton’s sweat drenched Great Western Hotel they busted out “Quinella Holiday” from the same album for the first time since 1984. Queensland is rightly famous for its great weather but the band’s final three shows in The Sunshine State were truly “the breaking of the dry”. 15,000 hardy punters partied at the Big Pineapple last Saturday night despite a torrential downpour. It was unforgettable. And just when it seemed that things couldn’t get crazier, a local pig literally ran amock through the middle of the drenched crowd! How the pig bought a ticket remains unknown. Rain also pelted on Sunday at Brisbane’s Riverstage, perhaps inspiring a droll version of “Too Much Sunshine” near the start of the show. Later they ripped out “Know Your Product” by local heroes The Saints as a thank you to the crowd for hanging tough on another wet night and leaving the local newspaper headline writer to declare “Oils and Water Do Mix”. Thankfully last night’s encore appearance at the same venue was not quite as moist but again the humour was dry. The band opened with “Redneck Wonderland” presumably in response to some more drivel earlier that day from a local redneck Senator whose mindless bigotry helped inspire that song over two decades ago. That incendiary start set the tone for a particularly intense show under some very welcome stars. Midnight Oil now head over the border to Coffs Harbour. More wet weather there over recent days has necessitated a site relocation but the forecast is looking good for clear skies tonight as The Great Circle returns to New South Wales.